Rasa, or Knowledge of the Self is the first gathering in English translation of essays and review articles on Hindu aesthetics and translations from the Sanskrit by the French writer René Daumal (1908-44). A member of the Simplist group associated from 1928 to 1932 with the journal Le Grand Jeu (”The Great Game”), he began cultivating his East Indian studies as an extension of his active pursuit of the avant-garde. In 1932, he made the acquaintance of Uday Shankar, becoming secretary to the latter’s Hindu dance troupe and accompanying it that year on its premier American tour. 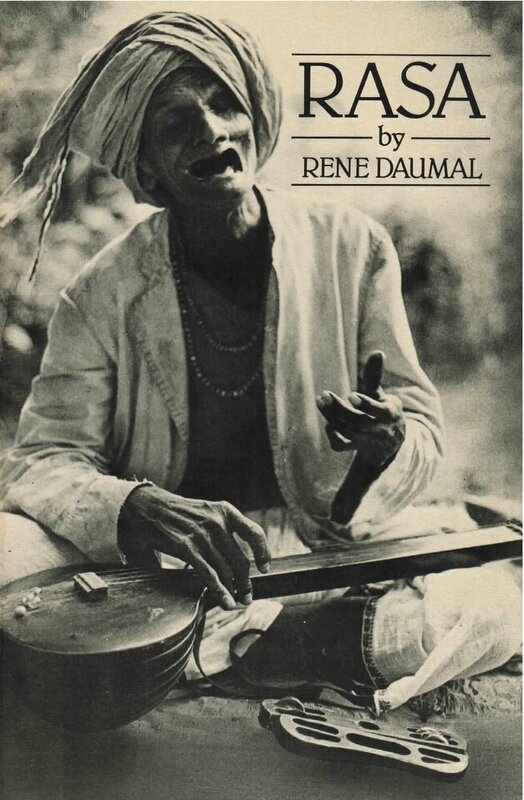 In his efforts to make Shankar’s music and dance comprehensible to Western audiences, Daumal developed into a passionate spokesman for Indian culture, and his subsequent writings on the subject are far removed from the usual dry philological speculations of academic Orientalists. “To Approach the Hindu Poetic Art” differentiates between the Indian and European views of aesthetic experience, with special emphasis on the concept of rasa––that is, “taste” or “savor”––which Daumal sees at the heart of all Hindu art. Two essays––”On Indian Music” and “Concerning Uday Shankar”––were written at the time of Shankar’s Western tour, while the selection of Daumal’s “Oriental Book Reviews” deals with topics, such as The Tibetan Book of the Dead, which were only to spark general interest in the West decades later. The remaining sections of the collection are translations from the Sanskrit that attempt to resonate against language’s deepest core.